We spoke with Peres Projects’ Javier Peres about the UK-based artist’s Independent presentation and the role of material in her work. A new sculpture that Ackroyd will debut at Independent, "Glory Slips", 2018. Steel rebar, chicken wire, plaster, wax, acrylic, synthetic hair, jesmonite. 113 x 90 x 161 cm (45 x 36 x 64 in). Courtesy Peres Projects, Berlin. Photographer: Matthias Kolb. Employing materials like wax, Jesmonite, chicken-wire, and plaster, London-based artist Rebecca Ackroyd creates sculptures that often probe the relationship between the body and architectural space. Since graduating from the Royal Academy in London in 2015, Ackroyd has been the subject of exhibitions across the UK and Europe, including a recent solo show at the Zabludowicz Collection this past fall. Ackroyd will make her New York debut at Independent in March, presented by Berlin-based gallery Peres Projects—a prelude to the artist’s first exhibition at the gallery, which will open in April to coincide with Berlin Gallery Weekend. “Ackroyd’s practice involves digging down into existing objects and memories and reconfiguring them into something new,” says Peres Projects founder Javier Peres. 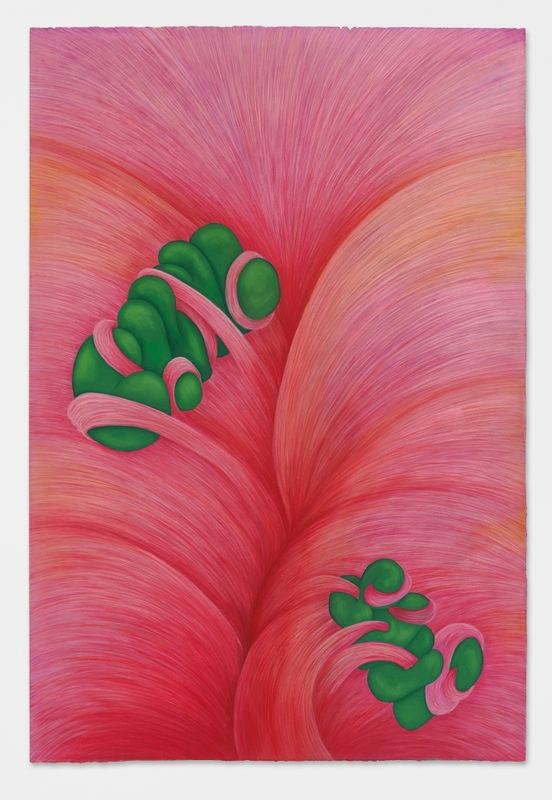 The gallery’s presentation at Independent will feature a selection of recent work in sculpture and drawing. 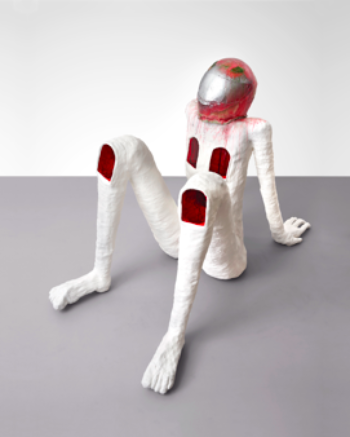 Two new sculptures depict crouching female figures wearing motorcycle helmets, with gleaming red voids on their chests and legs. Made from chicken wire, plaster, and wax, the figures “confront us with their stark rawness and present us with new notions of femininity and power,” according to Peres. Detail of Rebecca Ackroyd’s painting "Civil Soup", 2017. Gouache, charcoal and soft pastel on somerset satin paper 95 x 140 cm (37 x 55 in). Courtesy Peres Projects, Berlin. Photographer: Matthias Kolb. A sculpture from Ackroyd’s Carrier series, "Carrier 2017 UK", 2017. Jesmonite, graphite powder, photocopied images, tape. 210 x 79 x 17 cm (83 x 31 x 7 in). Courtesy Peres Projects, Berlin. Photographer: Matthias Kolb. 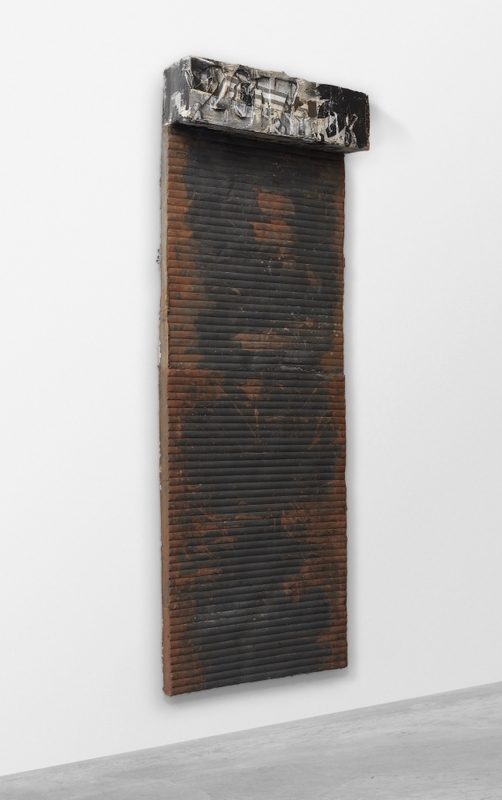 The presentation at Independent will also include wall sculptures from Ackroyd’s series “Carriers” (2017-18): large, textured panels made from graphite powder and Jesmonite—a composite material often used for building surfaces and architectural decoration—that evoke weathered storefront shutters. The top of each panel is adorned with a collage of pasted black-and-white images depicting the texture of London streets, some of which are drawn from newspapers and mass media imagery, others from the artist’s own photographs. The “Carriers” play with the relationship between the space of the gallery and the street, unsettling the boundaries between interior and exterior.